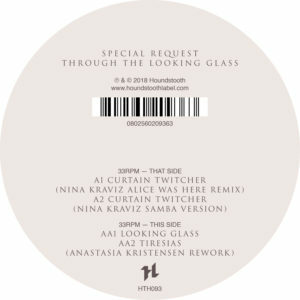 Special Request joins forces with Nina Kraviz and Anastasia Kristensen, shattering the doors of perception over a four-track EP. ‘Through The Looking Glass’ drops July 20th on Houndstooth. On the A side, Nina Kraviz provides two interpretations of ‘Curtain Twitcher’. ‘Alice Was Here Remix’ takes the intensity of the original and boils it into a 4/4 spin of frenzied basslines and distorted acoustics, punctuated by her languid reading of the Mad Hatter. For the ‘Samba Version’, syncopated polyrhythms take charge of a fragmented melody. Opening the AA side, ‘Looking Glass’ lures you down the rabbit hole with mysterious bleeps, only to reveal a whirlwind of stormy breaks and junglist percussion. Closing off the trip, Anastasia Kristensen’s remix of ‘Tiresias’ marches its way through a field of swollen bass and glitchy percussion.